« This is Right On! Shout It Out, Brother! 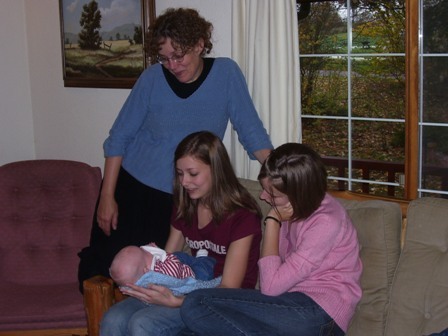 Baby Diederick receiving loving glances from his GrammaMomma (me), his Auntie Cadet, and his Auntie Teesie. This is another photo from mid-November, when Laura came for a visit. For current pictures of the cute little boy, check out Laura’s blog. This entry was posted on Friday, February 9th, 2007 at 9:26 pm	and is filed under Favorite Photos, Fun Things. You can follow any responses to this entry through the RSS 2.0 feed. Both comments and pings are currently closed. he’s so small in that pic 😛 I guess we visited a while ago now.